We all love when the snow melts and spring arrives. Bringing this season into the office is great for staff to celebrate the change and feel more upbeat. The energy will be contagious, inspiring customers to take action. Capitalize on this by encouraging conversations about fashion trends in eyewear for spring 2018. 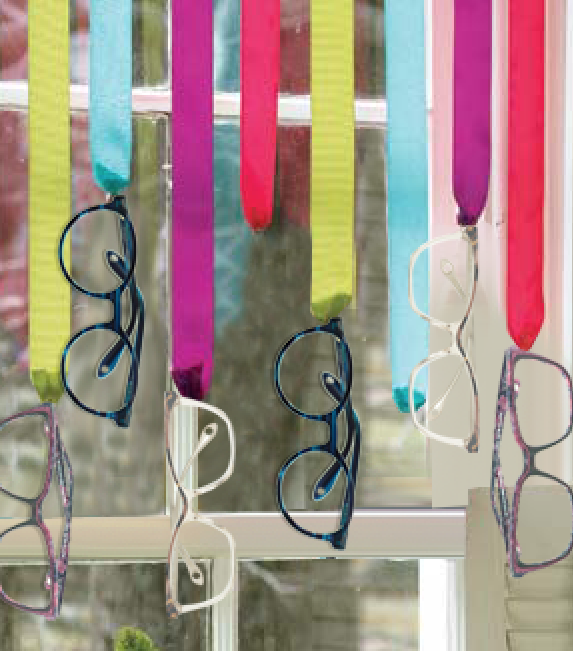 Allow sales to flourish with decorative spring themed eyewear collections in storefront displays, social media posts and in signage. 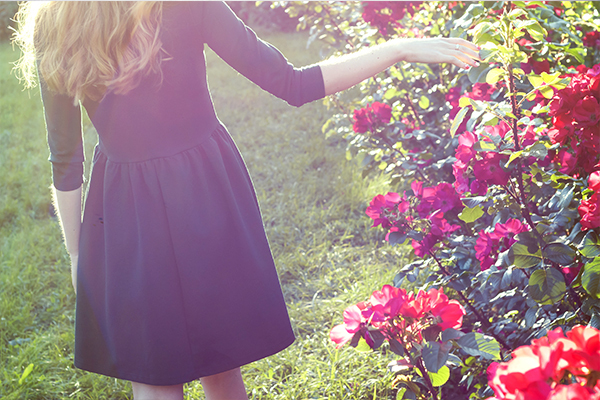 Here are a few ways to blossom the season to sales. Seize these feelings in marketing with blossoming accents. 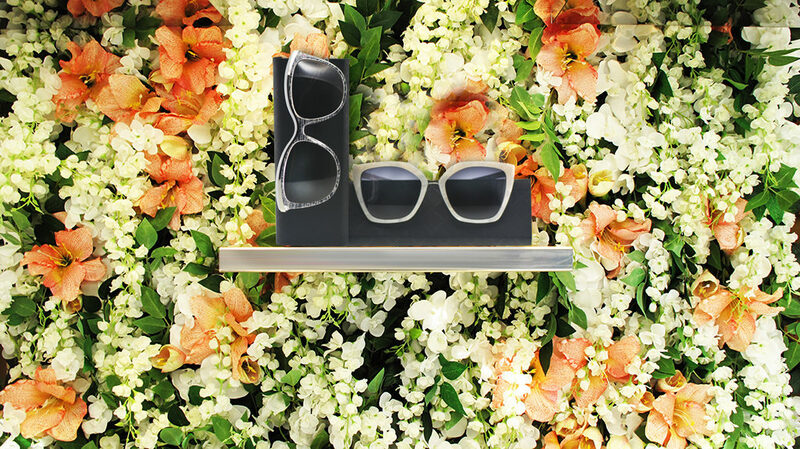 Dress up in-store displays with floral signage or go big and add a layer of temporary wallpaper behind glasses. This works best with bold frames or sunglasses like _F-2026-242, F-2028-260, F-3597-793, F-3603-815. The contrast will make the frames POP! Social media can bloom too! Use photos of frames with floral designs and patterns, or images of the office’s new spring displays. Take photos of staff wearing their favourite new frames inspired by nature’s colors and patterns. Or even encourage staff to wear spring prints to encapsulate the season for clients to have a full seasonal in-store experience. Dress up practice displays with scarves, ribbons, or bright material as backdrops. The name of the game is EYE-catching! Social media should be as vivid as the office’s dispensary. Use complementary or contrasting colours between the backdrop and the frames for posts that simply cannot be ignored. Local craft or dollar store will have Bristol board in a variety of colours to make eyewear pop! Bring the outside in, with spring displays include lush arrangements of flowers or plants. Foliage, whether real or fake, can really add a sense of new life to the office. If there is concern about allergies or maintenance but real plants are the main focus, succulents can be a good compromise. Use the plants to display eyewear. 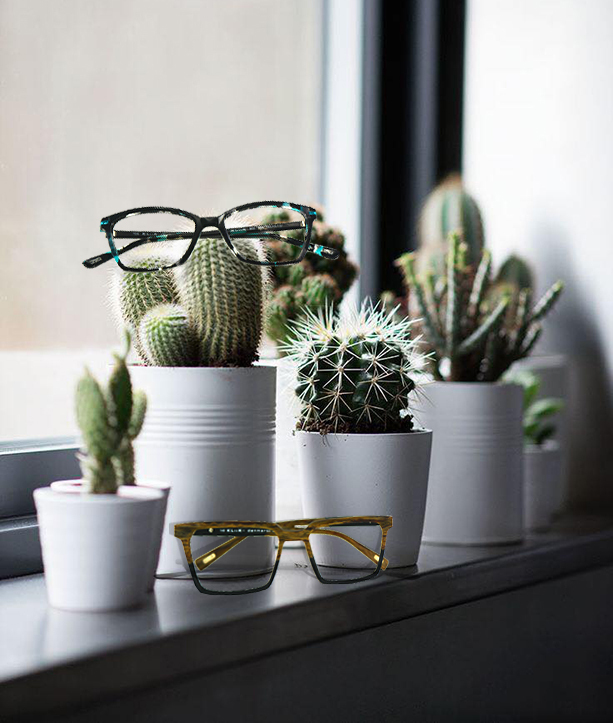 A cactus is a good stand for sunglasses or try hanging frames from the branches of a larger tree in the office. Not only will it make a fun display, it creates a beautiful photo opportunity for sharing on social media! K606, K611 or F3596 could work nicely for this. Days are longer and the sun seems brighter. Be bold and add colourful styles to displays. Choose F-2027-256, F-3606-827, K-608-500 and E-9158-923 for their impressive vibrancy and unique color combinations. Spring is about watching the world burst into bloom! Grass rises out of the soil, trees explode with leaves, and flowers erupt with beautiful colour. The world transforms into a blissful botanical garden. Step into spring with a fresh new look!